Nobody makes films like Quentin Tarantino. Plenty of people have tried to copy him, but nobody is able to combine dialogue, story and just the right amount of over the top gore as Tarantino can. He usually picks a genre of movies to honour these days. Kill Bill was an awesome shout out to Kurosawa and his samurai films, while Django Unchained honours spaghetti westerns. 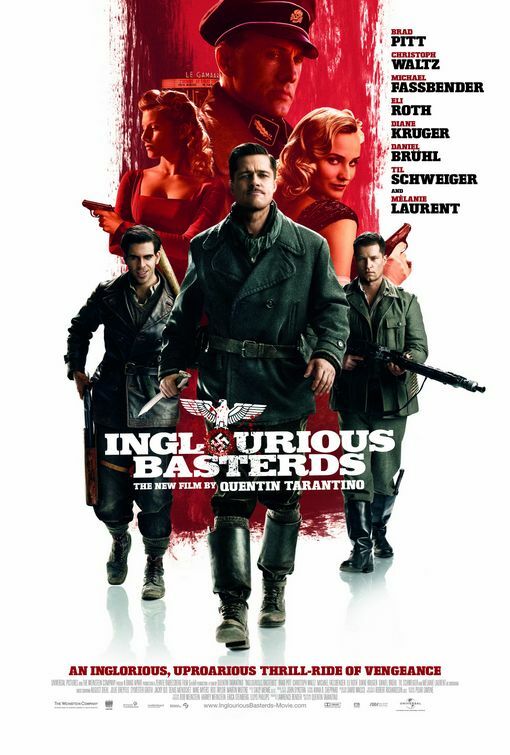 Inglourious Basterds is a terrific homage to the many World War II films that exist. I love the fact that it plays with history enough to tell Tarantino’s tale. The cast is also amazing, led by the always underrated Brad Pitt and Christoph Waltz in his Oscar winning role. Inglourious Basterds, in true Tarantino fashion, tells several different stories, eventually leading them all to meet up together. Colonel Hans Landa (Waltz) is a German officer hunting down Jews in France during World War II. Lieutenant Aldo Raine (Pitt) is an American soldier who leads a small squadron of Allied soldiers hunting down Germans, they are closer to guerrilla army than anything that would be officially sanctioned by the US Army. Shoshanna (Melanie Laurent) is the owner of a small cinema in France, she has managed to keep the fact she is Jewish hidden from the Nazis, but her whole family was killed by Landa when she was a child. Her cinema is to welcome Adolf Hitler himself for the premiere of one of his propaganda films, which is an opportunity she cannot pass up. Aldo Raine is also aware of Hitler’s presence and plans his own attack. Eventually the three characters’ stories intertwine with each other to show a very different take on the ending of World War II. My favourite part of this film is the opening twenty minutes when Landa is interrogating a French farmer that he suspects is hiding Jews on his land. The scene is mostly Christoph Waltz and the farmer talking and largely told in subtitles, yet I can’t look away. Waltz is so captivating as the evil German officer. He comes across as a bit of a buffoon, but there is this evil twinkle in his eye. He won the Oscar for this scene alone in my opinion. You can’t take your eyes away from him, and that is what makes his performance so powerful. I liked Brad Pitt as well. People sometimes forget how good he is, since he has a reputation of being not much more than a pretty face, but he can hold his own in the acting stakes. I can definitely see him winning some awards one day if he is given the right role. Outside of Leonardo DiCaprio, I think he is most likely to have an Oscar on his mantle one of these days. I love how Tarantino just plays with history. I think we can all agree that the end of World War II doesn’t fit with a typical Hollywood ending, so Tarantino changed it. It was ballsy to play with such an iconic time period, but it works in a Tarantino film. He is out there as a director, so him playing with history suits the tone of his films so well. I enjoyed it a lot. This is probably my favourite Tarantino film. The dialogue is terrific, and the story is fun, led by a terrific cast. Inglourious Basterds is like Pulp Fiction in the 1940s. Terrific dialogue and a terrific cast led by a brilliant performance from Christoph Waltz, makes this one of Tarantino’s more enjoyable films. At this point, I really think Inglourious Basterds is the only way a filmmaker can make a movie about WWII that people will take any real notice of. That particular war has been thoroughly considered over the past seventy years, and there aren’t many angles left to cover. So I guess the next logical step would be to start making things up, right? Quentin Tarantino is probably the only director who can get away with making a movie like this. It’s audacious to completely re-imagine the history of WWII. This movie delivers an alternate ending to the war– one where Hitler and cohorts meet a fiery end at the hands of a Jewish theater owner– full of revenge fueled violence. It’s the type of movie that could easily rub people the wrong way (and I’m sure it has), but it is so much fun to watch. What I really love about all Tarantino films is that they’re always excellently cast. Sometimes his choices seem odd, but they almost always end up being perfect. In Basterds the standout roles go to Brad Pitt and Christoph Waltz. Pitt is one of those choices that seemed strange, only because I couldn’t picture him ever doing a Tarantino movie. But much like Leonardo DiCaprio in Django Unchained, this will likely go down as one of Pitt’s most memorable characters. Everything about his performance as Lieutenant Aldo Raine is so fun to watch, whether he’s delivering humorous lines in a deadpan fashion or gleefully carving swastikas into Nazi foreheads. Christoph Waltz plays Raine’s main nemesis, SS colonel Hans Landa, and he is a revelation. There is simply no one else who could have played this role. Waltz hits the perfect balance of creating a character who is simultaneously charming and despicable. Every time I watch Basterds I am rapt during his scenes, in particular the opening sequence establishing his reputation as the “The Jew Hunter.” It’s almost a shame that this scene is the first in the movie, because it is by far the best. Not that the rest of the film is bad, it just doesn’t quite live up to the glorious and riveting opener.